Stay in style in Buffalo, New York — Where will you be checking in next? The city of Buffalo, New York, has undergone a remarkable transformation in the last years, from a redeveloped waterfront and revitalized neighbourhoods to a burgeoning craft beer scene and over $1 billion in new investments. Like architecture? Visit seven Frank Lloyd Wright structures or stroll through Frederick Law Olmsted parks. Enjoy art and entertainment? Spend the morning with Andy Warhol at the Albright-Knox Art Gallery, the afternoon with a Broadway show at Shea’s Performing Arts Center and the evening with the Grammy Award-winning Buffalo Philharmonic Orchestra. And, if you enjoy landmark properties and luxury hotels, these two establishments are worth a stay : Hotel Henry, an urban and modern boutique hotel that has recently opened in an old hospital and The Mansion on Delaware, the only four diamonds property in the entire city. Situated amongst 42 acres within the city of Buffalo’s cultural corridor, this «urban resort» is surrounded by parks and connected to the Buffalo Elmwood Village. Nestled within the iconic Richardson Olmsted Complex, a National Historic Landmark, Hotel Henry is a unique property rich in history, art, design and great taste. Hotel Henry is a brand-new "original-concept full-service hotel" that features 88 guestrooms and suites, destination amenities and seamlessly integrated technology. The hotel opened in April 2016 in an old hospital, which is, without a doubt, a unique feature. The heritage building has been totally transformed. Now, the rooms and common areas are modern, urban, luxurious, spacious and design-oriented. Rooms embody a variety of unique layouts, with efficient uses of the Richardson Olmsted Campus’ original design. The hotel is an open-air art gallery, as all the art pieces on the walls are available for purchase. Hotel Henry is partnering up with local artists to change the scenery and also to feature different collections every now and then. 100 Acres, The Kitchens at Hotel Henry, is an original culinary experience, offering a variety of dining opportunities, atmospheres, and interactions. Guests can enjoy breakfast, lunch and dinner in the different seating areas of the restaurant (the main dining room, the lounge, the lobby). The menu emphasis on regional products and contemporary dishes. Hotel Henry is also home to a bakery, a coffeehouse, a bar, and an entertainment-focused lobby. The Mansion on Delaware Avenue is Buffalo’s First & Only AAA Four Diamond Luxury Hotel. Located in downtown Buffalo, this award-winning luxury boutique hotel combines Second Empire architecture with modern elegance. Offering a 24-hour exclusive-to-the-city butler service, complimentary European breakfast, lounge access with free snacks and cocktails and a Range Rover car service, it is a true premium-service property. With only 28 guest rooms and suites, The Mansion is offering an intimate yet exceptionally service-oriented experience. 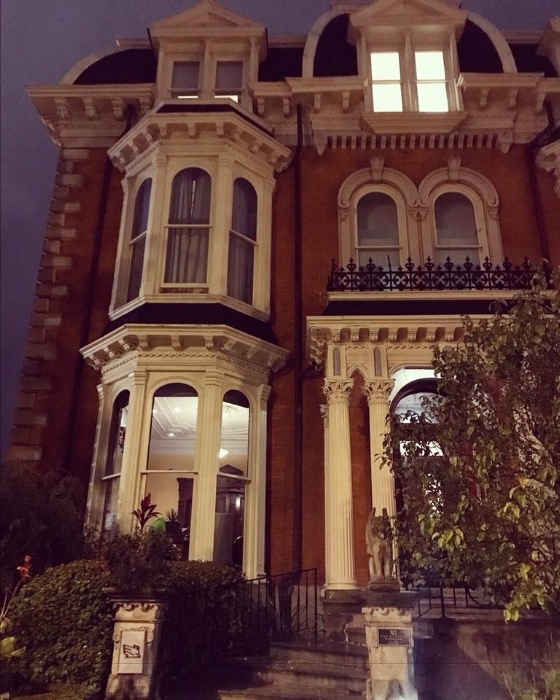 I spent Halloween at the Mansion on Delaware!